Today I go on a heritage walk to the majestic Vittala Temple, dedicated to Vitthala, the South India name of Vishnu. 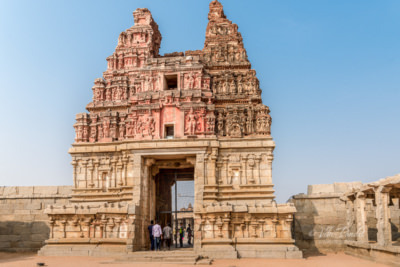 Built around the 15th Century CE, and expanded several times by succeeding kings of the Vijaynagar empire with the most extravagant architecture and exceptional craftsmanship, the temple is the main attraction of Hampi. Today I went to explore the quiet town of Anegundi. As per the legend of Ramayana, the city used to be known as Kishkindha where Bali and Sugreeva, the monkey kings used to rule. 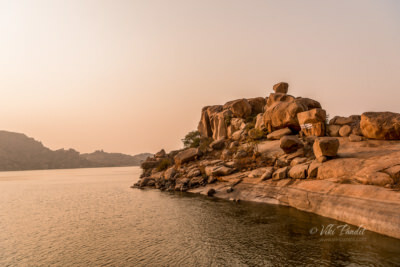 The monkeys though have been driven away by the growing number of foreign tourists and it is just the mystifying boulders that remain to tell us the story of what was once a strange but interesting kingdom. 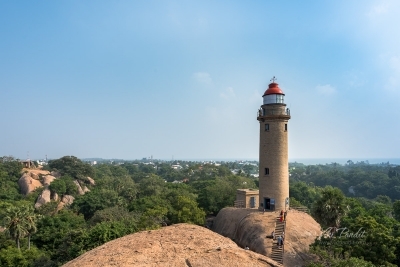 Before we head back to Bangalore, we decided to stop at the Mahabalipuram’s old lighthouse. India’s oldest lighthouse, built around 640 AD by Pallava king Mahendra Pallava stands next to the newer and modern lighthouse. The credit for this visual treat goes to the department of lighthouses and light ships which felicitated the re-opening of the lighthouse for the public, ending a decade-long ban over fears of terrorist threats. The Tiger Cave is not really a cave and tigers do not live here either. 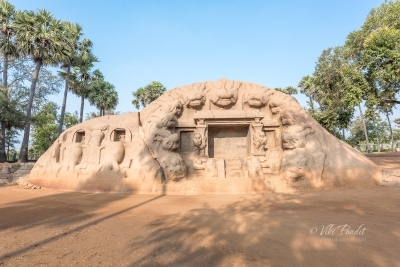 It is a rock-cut Hindu temple complex with carvings of tiger heads around the structure, located in the hamlet of Saluvankuppam near Mahabalipuram. These rock-cut structures with tiger-head like shapes are believed to have been constructed in 7th century by Pallavas. 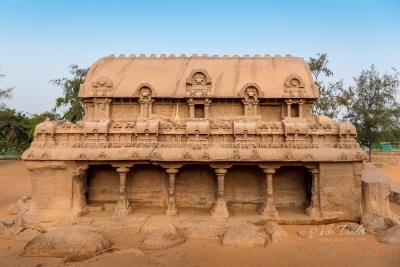 One of the most crowded places in Mahabalipuram, the Five Rathas or Panch Rathas are five monolithic temple structures built by the Pallavas in early 7th century AD. The buildings displaying exquisite carvings are named individually after Draupadi and the five Pandava brothers. I woke up at dawn to explore one of the most mysterious ancient artifacts found in South India. 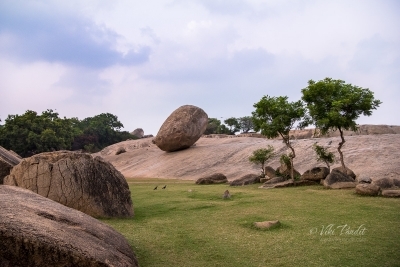 Krishna’s Butterball is a gigantic granite boulder resting on an extremely small and slippery area of a hill in the historical town of Mahabalipuram. This precariously balanced 250 tonne boulder is believed to be a bolus of butter, the young Krishna would steal. The rock continues to defy gravity and has been sitting on this 45-degree slope since mankind started keeping records. 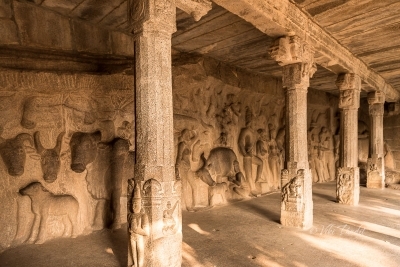 Today we go on a tour of the monuments of Mahabalipuram. The city of Mamalla, named after the title of Pallava ruler Narasimhavarman-I, was a sea-port during the time of Periplus and Ptolemy. Today it is a town studded with rock-cut caves, monolithic shrines, cave sanctuaries and structural temples. The open-air museum also includes the largest open-air rock relief in the world. The group of monuments at Mahabalipuram, were accorded the status of a UNESCO World Heritage Site in the year 1984. We drove to the Shore Temple at dawn to witness the pristine structure, built with blocks of granite, dating from the 8th century AD. Overlooking the shore of the Bay of Bengal, it is one of the oldest temples in Southern India. Constructed in the Dravidian style that reflects the royal taste of the Pallava dynasty, its sanctuaries are dedicated to Vishnu and Shiva. 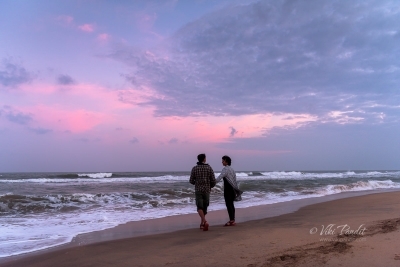 We sat under magical skies, immersed in the music of the strong waves of Bay of Bengal. 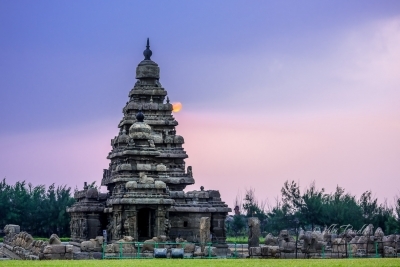 The historical town of Mahabalipuram is an enchanting place to explore age old stone carvings and century old temples, but in-between the sweaty hikes, one can cool their tired heels at the beautiful beaches along the east coast.